Beadlock Ring Spacer. For use with tire beads over 3/4" thick. TR Logo Center Cap, Stylized Black ABS push thru type with TR Logo. TR-645HD. Fits HD Wheels. Complete Install Kit includes 4 hardware bags, 4 ea. 60 degree valve stems, decals and installation instructions. TR-670HD. Fits HD Wheels. Complete Install Kit includes 5 hardware bags, 5 ea. 60 degree valve stems, decals and installation instructions. TR-650. Complete Install Kit includes 4 hardware bags, 4 ea. 60 degree valve stems, 4 starter bolts, decals and installation instructions. TR-675. Complete Install Kit includes 5 hardware bags, 5 ea. 60 degree valve stems, 4 starter bolts, decals and installation instructions. Our 45 degree steel valve stem allows clearance with Beadlock Rings. Our Wheel includ these stems as standard feature. These are replacements only. Our 60 degree steel valve stem allows clearance with Beadlock Rings. Our Wheel includ these stems as standard feature. These are replacements only. 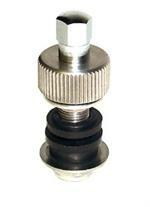 Our 90 degree steel valve stem allows clearance with Beadlock Rings. Our Wheel includ these stems as standard feature. These are replacements only. TR-600. Fits A15, A16, A17, A18, . Replacement beadlock hardware. 24 ea. Grade 8 1-1/4" x 5/16-18, flat washer, grip flange nut. One wheel per kit. TR-700. Fits HD15, HD17,HD20. Replacement beadlock hardware. 28 ea. Grade 8 1-1/4" x 5/16-18, flat washer. One wheel per kit.